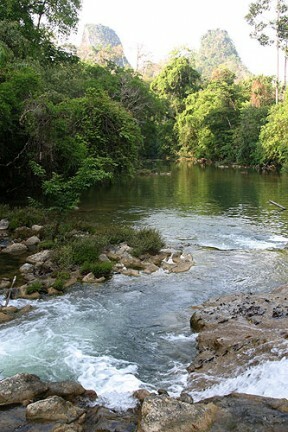 The Hanthayaw River is known by the name 'Suriya' in Thailand. The rostral process is highly flexible, though its precise function remains unknown. The red colouration in the rear portion of the body can vary considerably depending on the mood or condition of the individual. Appears to be endemic to headwaters of the Salween River basin around the border between Myanmar and Thailand, where it’s known from the upper Ataran and Hanthayaw watersheds. In Thailand the Ataran and Hantayaw are known as the Kasat and Suriya, respectively, and are located in the Thung Yai Naresuan and Huai Kha Khaeng wildlife sanctuaries. These covers parts of Kanchanaburi, Tak and Uthai Thani provinces and represent one of the few remaining pockets of pristine forest in the country. Inhabits shady, fast-flowing stretches and riffles but is also found in deeper pools at times. Such headwaters are well-oxygenated with clear water, a substrate comprising sand, gravel, rocks, boulders and patches of leaf litter with a rich biofilm normally carpeting solid surfaces. Submerged driftwood and the roots of marginal vegetation are also typical features. Aquatic plants such as Cryptocoryne crispatula var. balansae and Pogostemon helferi grow in stiller parts of these well-oxygenated habitats. 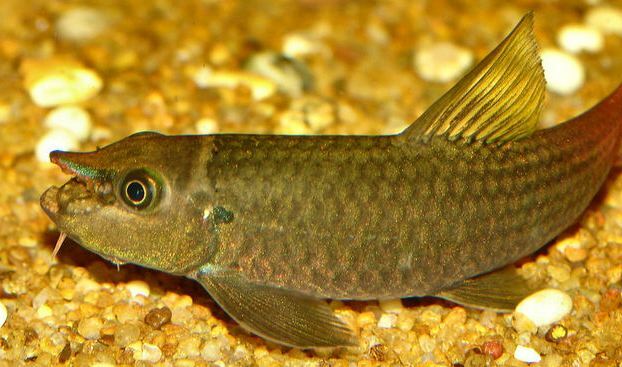 Other fish species occuring in the two drainages and which may occur sympatrically include Parambassis pulcinella, Botia kubotai, Acanthocobitis pictilis, Schistura maepaiensis, Homaloptera modesta, Syncrossus berdmorei, Pangio fusca, Pethia stoliczkana, Microdevario kubotai, Crossocheilus burmanicus, Akysis vespa, Glyptothorax dorsalis, Amblyceps caecutiens, Batasio feruminatus, B. dayi, Caelatoglanis zonatus, Psilorhynchus robustus and Tetraodon cutcutia. An aquarium with base measurements of 120 ∗ 30 cm should be the smallest considered. It isn’t particularly tolerant of conspecifics but apparently exists in loose aggregations in the wild. 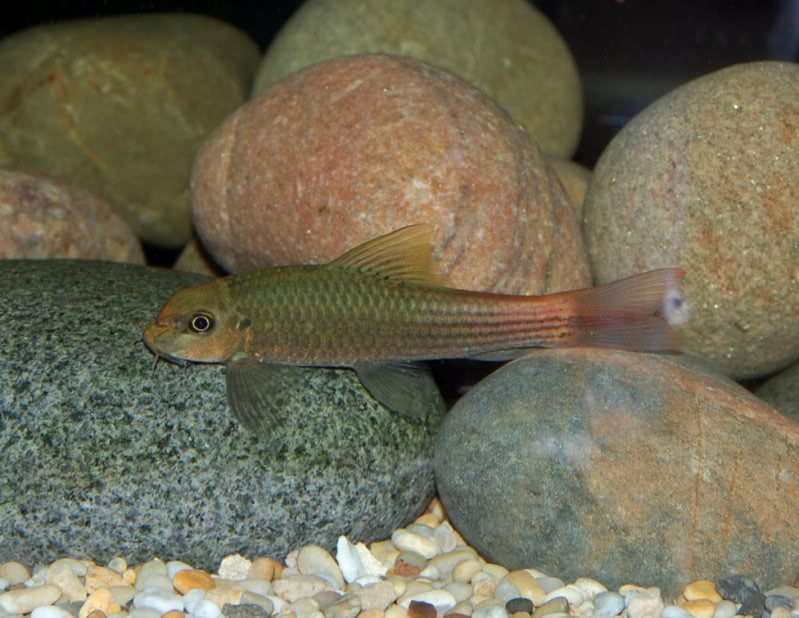 If kept singly it tends to behave more aggressively with similarly-shaped fishes so we recommend the purchase of 3-4 or more should space permit. 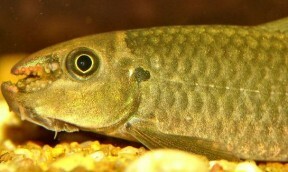 Such a group will develop a noticeable pecking order between themselves but tankmates are more likely to be left alone. 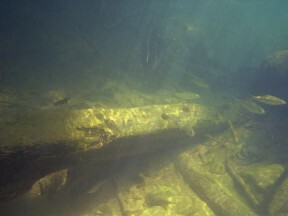 What appear to be hierarchical disputes will sometimes occur and involve charging, flaring of fins, an overall paling of the body colouration, and, in males, extension of the rostral process. Unconfirmed although adult females are likely to be thicker in the body than males. 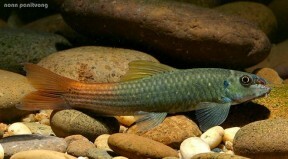 In many other Garra spp. sexually mature males develop more prominent head, and sometimes body, tubercules when in spawning condition. 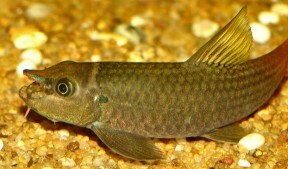 A putatively undescribed species often imported and sold as G. sp. ‘burmanicus’. It first appeared in the trade during 2005 and has since been available on a sporadic basis, usually with a relatively high price tag. As well as its unique colour pattern, a primary diagnostic character is the presence of a proboscis-like rostral process between the eyes. 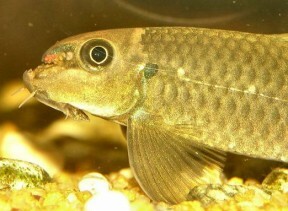 This is flexible appears to act as an indicator of mood, becoming erect when the fish are engaged in territorial conflicts or courtship behaviour, although its precise role is unclear. The underside, visible only when the appendage is extended is light-coloured and covered in a series of tubercules suggesting it may also have a visual and/or chemical function(s).